I very often lose faith in people, as a whole. They tend to be greedy, unrepentant, pestilent, and self-serving. This morning seemingly started in that vein. I saw what looked like a parking ticket on our car’s windshield (a car we never drive because we don’t trust it). We live on a heavily monitored street that is permit-only parking beyond two hours. Our car has been there about five months. What is under the windshield wiper is not a ticket, but a note; soaked and bleeding ink from last night’s storm. 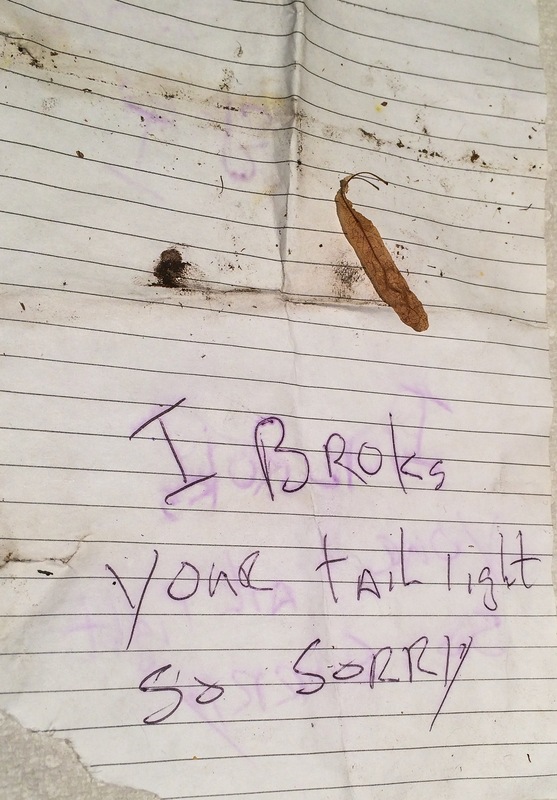 The note reads “I broks your tail light so sorry”. Awesome. Wrapped inside the folded note was a business card that, seemingly ironically, said “We Got Your Back”. 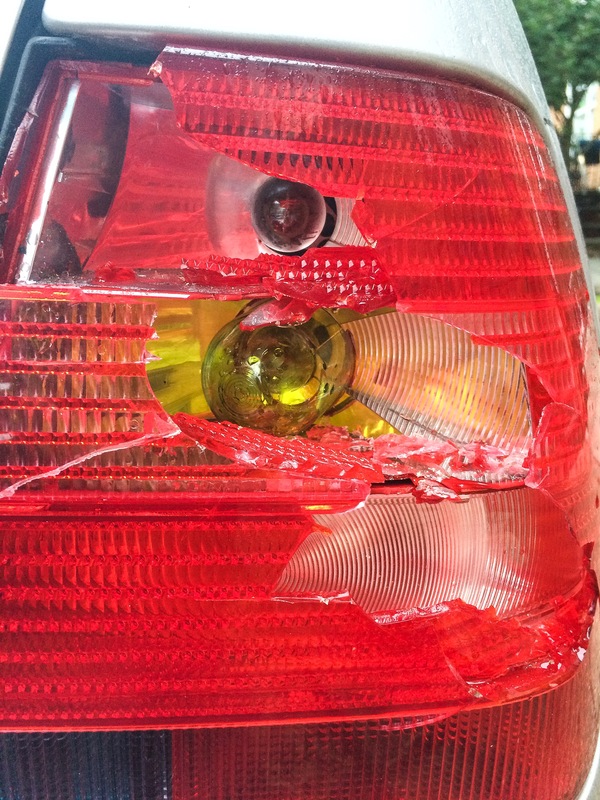 I walk around back, and indeed, they did get my back – a busted tail light and some dent damage. I brought the note and business card inside and rested them on a paper towel to dry, and went back into the drizzle weather to re-start my commute to work by walking to the subway. My rides home from work have been less than relaxing, namely due to the shittiness of those with whom I share the ride with back to Philadelphia. This typically puts me in an unpleasant mood after work, and supports my loss of faith in people. So it goes. After I got home today, I called the number on the business card. I explained why I’m calling and the guy right away started apologizing. He kept saying he’s sorry, and how it was an accident, and how he wanted to make it right by getting a new taillight and either replace it himself or get a mechanic buddy of his to do it. He even insisted on stopping by to apologize in person, and did so about 15 minutes before I started writing this out. The guy was genuine in his apology. He was honest enough to leave a note under our windshield to let us know that he is the one who did the damage (someone else, months ago, backed into the front end of the car, smashing the front grill; and did not leave any note). Sure, there’s still a dent left un-addressed, but I’m not going to split hairs about that. This guy went above and beyond. He made sure to do right by me, and in the process he had lessened my loss of faith in human beings. Meeting solid people in life has become such an occasion that I feel the need to write about it, especially when it could have gone in such a different direction. This guy did wrong and fessed up to it. This guy got my back.